During Epic’s Unreal presentation at GDC, Gearbox Software showed off some rendering tech that “may be used in a future Gearbox game”. It’s Borderlands 3, quite clearly. Check our list of upcoming PC games for more future hits. 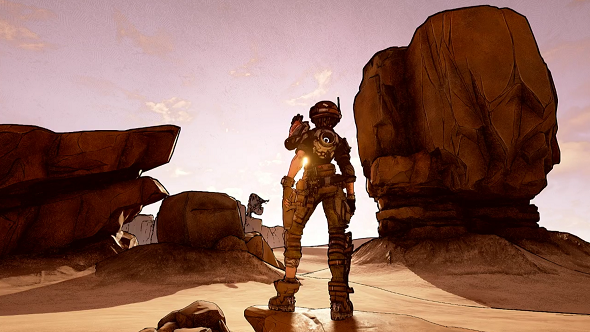 The tech showed off how the team will be creating the next-generation of Borderlands’ cel-shaded world, all with real-time shadows. Does that mean Borderlands 3 will have a dynamic time-of day system? Possibly. Even more interestingly, Gearbox’s Randy Pitchford says the new tech can also simulate physics depending on the planet’s properties. There was also a character teased, as you can see in the image at the top of this page, but their face was always concealed, hinting that it’s perhaps a returning character. Later on in the presentation, there was even a point where she was side-on and Pitchford teased that they had positioned the pauldron so we can’t see who it is. My guess? Not-so-Tiny Tina. Watch the stream below, from 1:04:00.